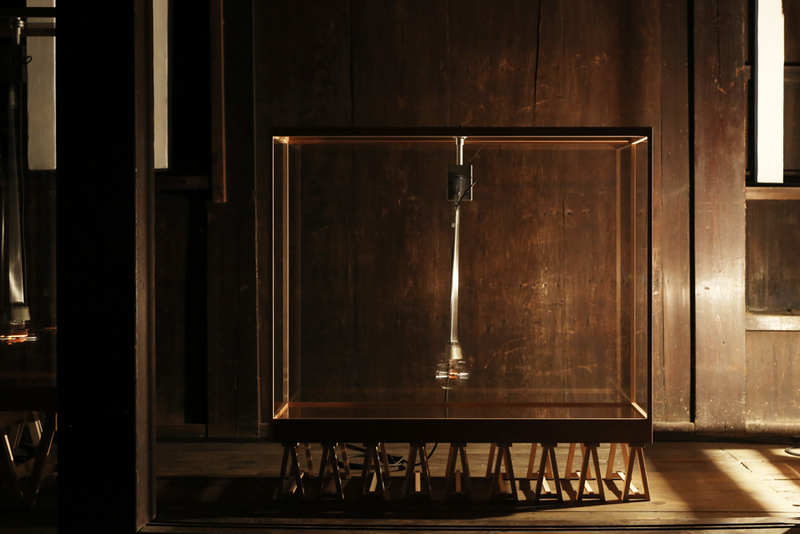 Materials : Wood, Glass, Light bulb, Light, Sound, Aluminium, etc. This work by Tsuyoshi Hisakado was presented at Culture City of East Asia 2017 Kyoto “Asia Corridor Contemporary Art Exhibition” (Kyoto, 2017). 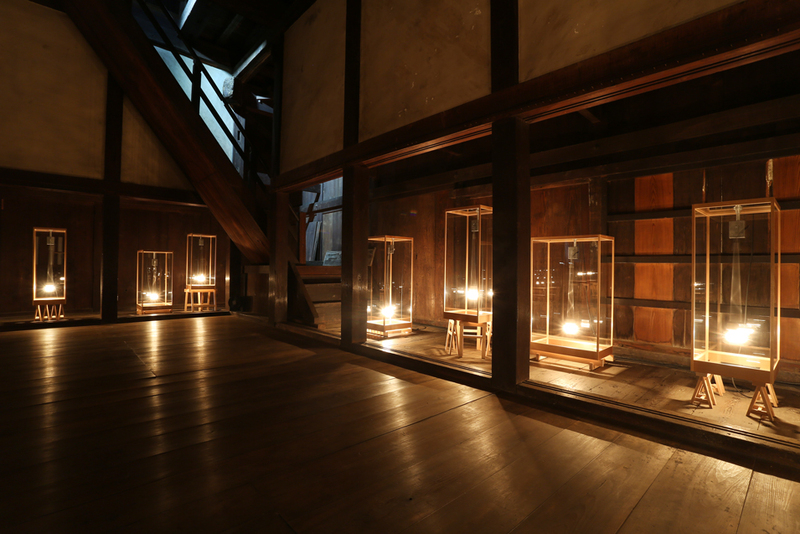 The work is site-specific and was presented at the two-story space of Sumi Yagura (corner tower) at Nijo castle. 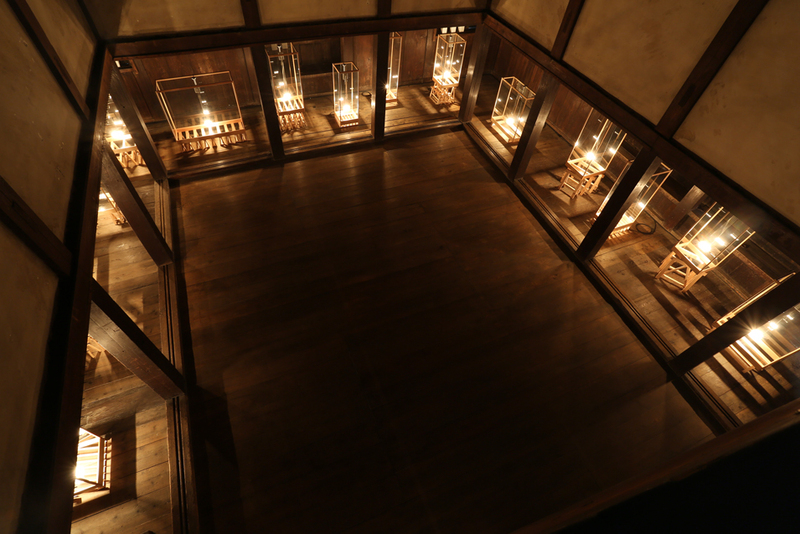 18 sets of glass cases containing light bulbs that swung like a pendulum occupied the lower level. On the upper level, one hears the sounds of wind recorded by the artist in forests. 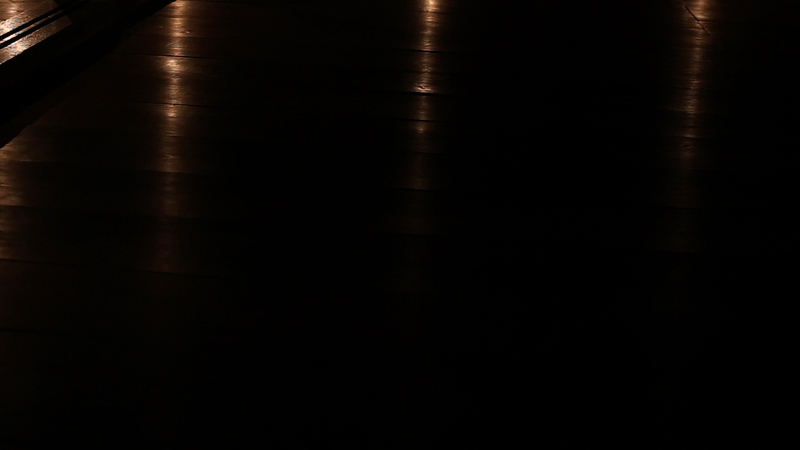 The work, as a whole, constitutes a mixture of light, sound and intricate sculptures. Its double-story configuration has a connotation to social power structures. Its theatrical presentation is poetic, yet with hints of social criticism. 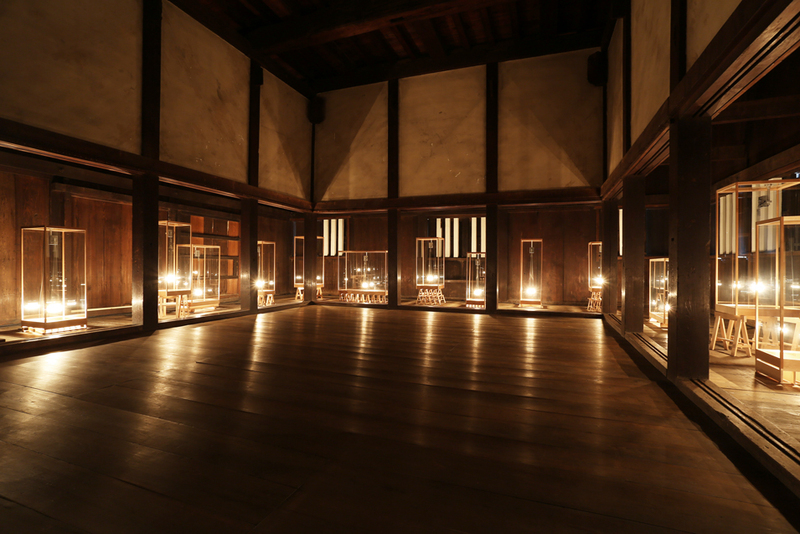 If we were to consider the double-story structure of the work in relation to ideas of maternity and paternity, the space on the lower level can be thought of as the “inner space.” This is a comfortable space composed of delicate lighting and sculptures. Like a pendulum clock, the swinging movement of the light bulb marks the passage of time and yet allows for all things to remain in its current state. In contrast, the sound of thunder, lighting and wind reminds one of the harsh “outer space,” creating the impression of a mighty power and a harsh outer world that is difficult to overcome. By allowing opposing ideas that are at the core of humanity to co-exist in the work - maternity versus paternity, primitive nature versus societal norms, oneself versus the other - Hisakado gives multiple layers to the meaning of the work and also depicts human beings and society at a micro level. Despite the diverse elements present in Hisakado’s work, its well thought out structure allows for a balanced work complete with poetic sentiments, void of any references to political content or feelings of nostalgia. Viewers are free to think and feel given the openness of the work. Interpretations of the work will be as wide as the number of its audience and the meaning of the work will continue to broaden over time. 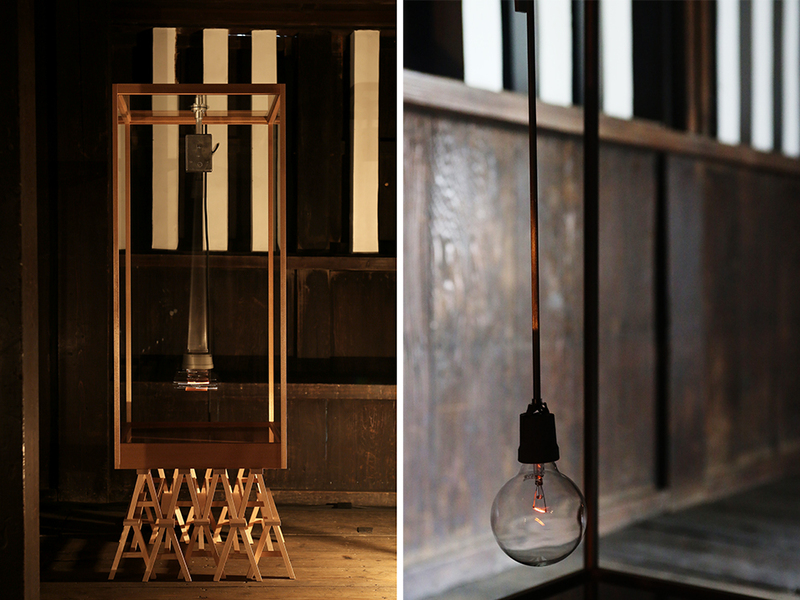 Herein lies the poetic aspect, attraction and endless possibility of Hisakado’s work.